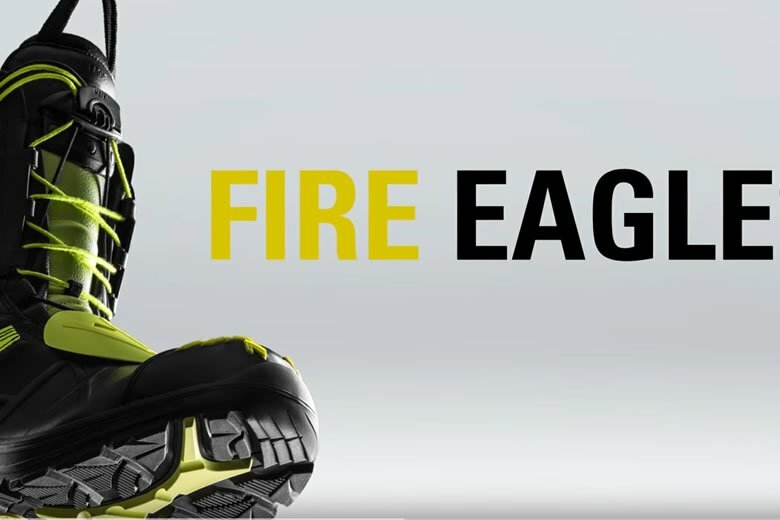 HAIX Fast Lacing System for Fire Eagle Fire Boots offers freedom of movement and comfort when fire fighters are on the job, every second counts. They need to be able to put on their safety boots quickly and must be capable of rapid and flexible movement once they have done so. The HAIX Fire Eagle is a functional boot which can cope with extreme temperatures and afford you the protection you require in any weather conditions. It is simply the best option for professionals facing such challenges. A two-zone lacing system permits you to put your boots on in under ten seconds. The width of the boot is initially individually set by each wearer to ensure a perfect fit around the calf and the foot. The shaft area has been manufactured in such a way so as to deliver maximum movement, even when kneeling or crouching. The new enhanced HAIX Fire Eagle is a slimmer and lighter version of the previous model. Weighing in at less than 1,000 grammes, it sets the standards for a new generation of fire fighter safety boots. The new HAIX Fire Eagle was first presented at the specialist “Interschutz” fair in 2015 and has been perfectly adapted to meet the needs of its target clientele. As well as being especially light, this is a boot which also offers plenty of comfort and robustness. Its black and yellow design, which extends from the toe cap to the sole area, lends it the appearance of a modern sports shoe. Nevertheless, it also fulfils the very highest safety standards. The HAIX Fire Eagle is particularly heat resistant and can even withstand temperatures of more than 250 degrees without suffering any damage. A toe cap manufactured in an ultra-light and robust glass fibre composite prevents any falling objects from harming your feet. The sole of the boot is also completely slip resistant thanks to the use of a special technology. Your feet will not sweat inside the HAIX Fire Eagle, even on long working days. Both the leather and interior lining of the boot are particularly breathable. This means that moisture is able to evaporate and be expelled. At the same time, the boot makes use of the movement the wearer generates to transport moisture from the interior to ventilation slits at the shaft and tongue. Inlays also absorb sweat to leave you feeling fresh and comfortable, even after many hours of wear.